class="post-template-default single single-post postid-297696 single-format-standard custom-background group-blog header-image full-width singular wpb-js-composer js-comp-ver-5.7 vc_responsive"
KEARNEY – Logan Krejdl and Taylor Janicek want students’ voices to be heard. 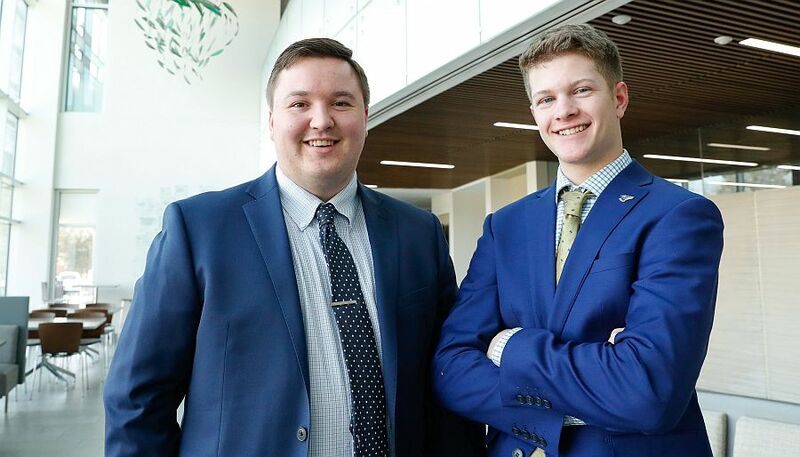 The newly-elected student body president and vice president at the University of Nebraska at Kearney believe every Loper should have a say on issues such as state funding for higher education, campus improvements and academic policies since they’re directly impacted by these decisions. The incoming student government leaders are committed to doing their part, but they also want to see more UNK students involved. A major focus for the duo over the coming year will be the university budget and ensuring tuition remains affordable. Krejdl and Janicek, who both have previous experience with UNK student government, recently attended “I Love NU Advocacy Day” in Lincoln along with dozens of other representatives from all five University of Nebraska campuses. The group met with state senators inside the Capitol to show their support for the university system and encourage lawmakers to adequately fund higher education. UNK student government members shared the same messages through letters sent to senators. “It’s such a small effort and it can make a huge difference,” said Krejdl, who will take over as student body president during an April 3 inauguration. Krejdl and Janicek want to get more students involved in this effort to persuade state lawmakers to avoid large cuts to the university system’s budget that could lead to tuition increases or a reduction in programs and staffing. They’re urging students to speak up because, they say, that input can strike a chord with lawmakers already hearing plenty from lobbyists and university administrators. “It’s the personal stories that have the biggest impact on the people making those decisions,” said Krejdl, a business administration and sports management major from Aurora. Plus, Janicek added, the Legislature’s decision on university funding will affect UNK students now and into the future. The Legislature began debate this week on an $8.8 billion state budget that reduces funding for the University of Nebraska and state and community colleges by 2 percent for the current fiscal year, which ends June 30, followed by a 1 percent cut in 2018-19. Last month, UNK announced $3.4 million in budget cuts tied to decreased state aid, declining credit hour production and scheduled salary and benefits increases. Krejdl said he wants to make sure every high school student has the opportunity to attend UNK and experience all the activities offered in a university setting. “I think the biggest thing for me coming to a university was the campus involvement you wouldn’t necessarily get at a community college,” he said. The UNK juniors want to enhance that on-campus experience by backing a few improvement projects. “I would like to see more stuff to do outside,” said Krejdl, including the addition of a sand volleyball court and picnic shelter where different groups can meet. These amenities are available at city parks, but Krejdl said having them on campus would create a friendlier feel for current and prospective students. The student body representatives are also excited to see continued progress on the Nebraskan Student Union upgrades. A $6 million remodeling project started late last year includes the addition of a Chick-fil-A and full-scale Starbucks, student lounge with a fireplace, new interior finishes and furniture and improved HVAC, lighting and sewer systems. That work is expected to be completed before classes start next fall. Krejdl said he and Janicek, a psychology major from Bridgeport, will follow the progress closely and seek student input whenever possible, such as when the time comes to select new furniture. “We’ll see what they want us to do,” he said. On a related topic, the two said they plan to look at on-campus parking to ensure it’s accommodating for students living in residence halls and also welcoming for the community members needed to support Chick-fil-A and Starbucks. Other goals for their time in office include establishing a true dead week before finals that’s limited to review sessions, pushing for policies that require professors to provide timely feedback and avoid scheduling tests and large project deadlines during career fairs and improving the dining committee for Louie’s Diner and The Market @ 27th. Krejdl said he’ll put an emphasis on transparency, sending messages to fellow Lopers through social media or the student bulletin so they know what’s happening in student government. He also wants to hear feedback on the issues and ways to improve UNK. “We’re really banking on the students,” Krejdl said.